I’ve received some emails asking to see my sukkah, so here it is! I didn’t have a lot of time to decorate this year, so it’s not as fancy as in years past, but I’m still proud of it! We’ve had some terrific meals in it during the past week. 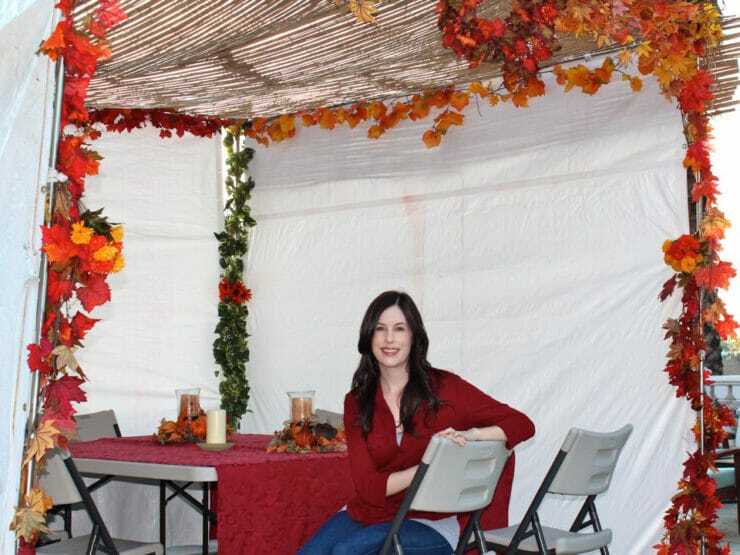 There’s something so fun about eating out in the sukkah. Sukkot ends tomorrow. It’s been a fun week! Chag Sukkot Sameach! How did u build this? We really want to put one up this year and this is beautiful! Did u use a kit? Yes Molly, there are many kits available online, just search “sukkah.” We bought ours at a local Judaica store. The decorations are my own, though. I bought them at various craft stores. So neat to see your sukkah. Lovely! Yay! I was hoping you’d post a picture of your sukkah….you DID go “Martha Stewart” on it! Nicely done! 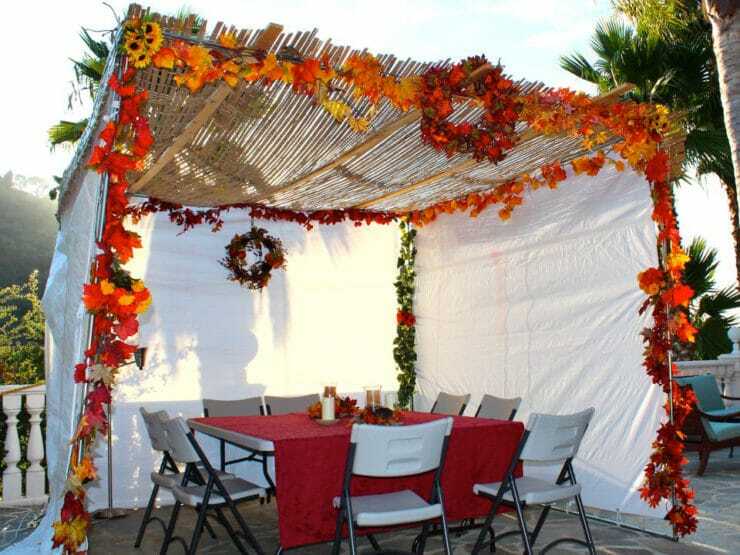 Your sukkah is beautiful! You have completely inspired me to fully celebrate Sukkot in our home next year. Beautiful!! I love it! I have an apartment, but cannot wait to have my own sukkah whenever I have a house! Chag Sukkot Sameach to you and yours! Thank you for the words of encouragement Linda! It’s a lot of work each year, but once it’s up we’re so happy– it’s a special tradition. Beautiful Sukkah surrounded by palm trees and sun! Not quite like in Michigan where people were chasing their sukkah’s down the street when the wind and rain hit 40 mph! Chag Sameach! Oh, Tori, it’s BEAUTIFUL! You are such an inspiration to me! It’s too late for me to do a sukkah for this year, but next year I am definitely putting one up. Thank you for sharing with us! Thank you Carol! I hope you’re able to celebrate next year! I’ll pour you a glass tomorrow night… it’s our last night in the sukkah. Sad to see it end! Your sukkah looks so inviting. Long enjoyable talks with food and family in such a beautiful place….such fun. It’s been really fun Sherry. Thanks for stopping by! that is beautiful! thx for sharing this photo, and this part of your life. the girl in the pic is also very beautiful! Love it! Every year I say I’m going to put up a Sukkah, then I don’t plan ahead and it doesn’t happen. I’m determined to get ready for next year, especially since my little one came home with a miniature version from religious school last week! That’s so cool Angie! I posted some mini sukkahs last week (made with graham crackers), it’s a great project for the kids. Nice Sukkot, T…. :)… Chag Sukkot Sameach!